There are basically two types of referrals in Dentistry; patient referrals and specialist referrals. Let me explain. 1) Patient Referrals: Though not really the subject of this blog, these are the types which keep a dental practice going and growing too! When an existing patient refers someone else to our office, it means we’ve done something good. It’s your way of saying that ‘we have confidence in you’ and let me tell you, we can’t thank you enough! 2 ) Specialist Referrals: These are referrals that we provide for the patient when we need someone who can provide specialized treatment for them. 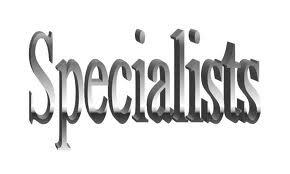 A specialist is someone who has gone on in their training and focuses on just one aspect of the dental field. a) The dental procedure may be too difficult or complicated for a General Dentist i.e. a tooth needs a difficult root canal because the tooth is far back in the mouth and the roots are all twisted and curvy. It’s easier for a root canal specialist (Endodontist) because they can best treat the most complicated cases and have special instruments that will enable them to deal with the twisted and curvy canals. b) Consider this as well: An anxious patient needs their wisdom teeth out, but it must be done while they are asleep. An Oral Surgeon would be the place to go because they have the set-up to administer General Anesthetic and are routinely removing wisdom teeth. c) And to address the last blog and give recognition to the gum specialists, there is the Periodontist. If there are issues or problems with the gums and underlying bone that support the teeth, then we refer to a Periodontist to fix them. The goal of treatment is to make sure that the ‘foundation’ is as strong as it could be and the patient can easily keep the areas that have been ‘treated’ by the Periodontist as clean as possible. As a General dentist, you have to know when to refer a patient to a specialist and do what is in the best interest of the patient. What makes it easier for patients these days is that many dental offices, including ours, offer in-house specialty services. This means that different specialists work out of the general dentist’s office, and the patient just has to come to one location for their treatment. Our patients really like the convenience of this! Along with General Dentistry, Dr. Axelrad’s practice is home to a variety of dental specialists able to look after all of your dental needs. Give us a call at 905.791.3867 to learn more. Dr. Robert Axelrad is a Brampton dentist who owns and manages his own dental practice in Brampton, Ontario. Affectionately known as ‘The Gentle Dentist‘, his patients include children, adults and seniors from Brampton and across Mississauga and the Greater Toronto Area (GTA). Dr. Axelrad recently moved his practice to its current, state-of-the-art dental office at Bestgate Professional Center in in 2002 to accommodate his growing list of happy patients.